Look out for a new poster on the London Underground this week. 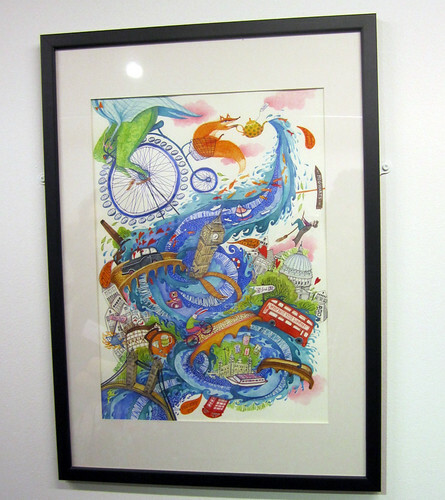 It's Anne Wilson’s ‘Winding Through the City‘ which won first prize in the Serco Prize for Illustration on Monday evening. 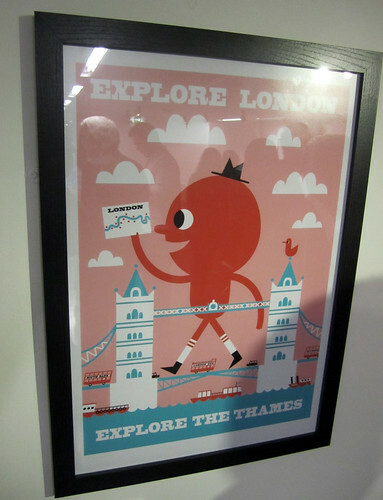 London Transport Museum is home to an exhibition of the best 50 entries to the competition run in partnership with the Association of Illustrators. The brief was to "submit images that feature the River Thames as an exciting and varied place for Londoners and visitors alike." The exhibition runs until 3rd June 2011 and has some wonderful illustrations on display. The Thames is such a part London's iconic images that there was an outcry when it was temporarily removed from the Tube map. Matt Oxborrow's "An Average Day on the Thames" was my personal favourite, as I loved the idea of people floating down the river on roundels. 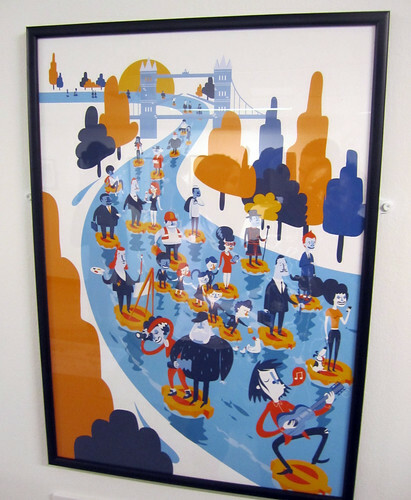 He's also illustrated a whole range of Londoners who might use the Thames for work or pleasure. It was interesting to see so many interpretations of the Thames many of them showing a vertical West/East divide, rather than the more familiar horizontal division. 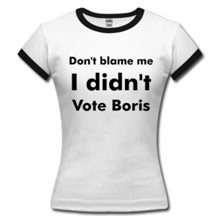 I liked Anne Wilson's winning entry and it was good to see how well it worked on London Transport Museum merchandise, that was on display. The detail on some of the other illustrations was amazing, but I'm not sure how well they would have transferred to mugs, mousemats, bag and posters. I'm a sucker for retro looking things and particularly liked Matthew Bromley's Explore The Thames for this reason. 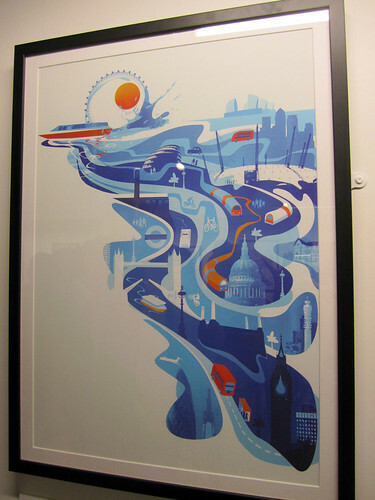 Andy Potts' London Flow worked really well with a simple colour scheme and various modes of transport literally flowing through the river. I loved the fairytale detail in Madalina Andronic's 5 o'clock Thames. She was standing next to me when I was taking a picture and I asked her how long it took. "Three days", she said. I don't think I could complete something like that in three years! There's a few more pictures on my Flickr set of the exhibition. If you look closely in one you'll see the reflection of IanVisits who also came along the opening and has written a blog post with his impressions too. 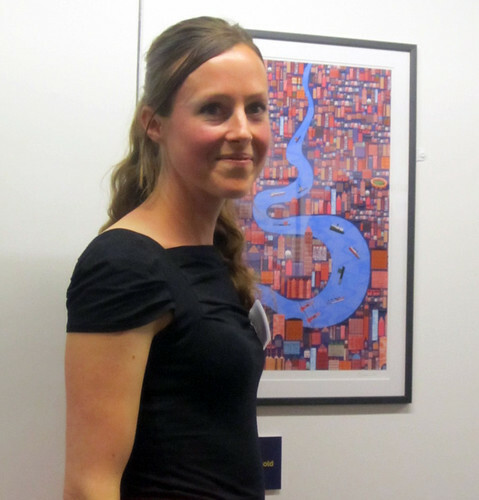 To support the exhibition on Saturday 21 May at 3pm London Transport Museum Senior Curator, Claire Dobbin, will give an illustrated talk "Poster Art and the River Thames" about how the River Thames has featured in over a century of London Transport posters. The hour long talk is £8 – or free to annual season ticket holders (you're advised to phone 020 7565 7298 in advance to reserve your place).